If there's one thing in our house that is less than perfect, it is the bathrooms. 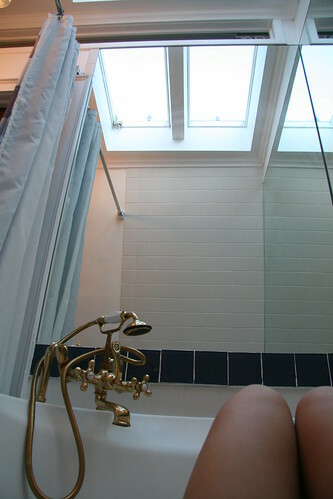 I've always dreamed of renovating the main bathroom by extending it out and putting in a jacuzzi tub with a picture window and skylight. Unfortunately, I'd have a view of the neighbor's industrial garage. Not that I care about the privacy, only the view. It needs to be a sanctuary in the woods. But would having a nice bathtub make our precious trips to Newport less special? When Doug and I go away to Newport, I always take the opportunity to have a relaxing bath while Doug sleeps in. But being a bit Type A, I can't simply relax in the tub. 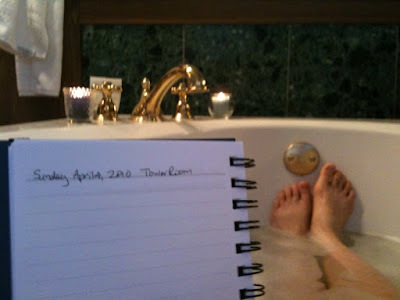 One year, I brought the laptop to the tub. I happened upon a post titled "The Art of Bathing" (no longer available) and had to take this iPhone picture to prove it. 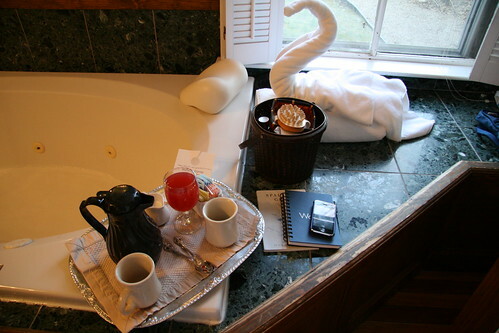 "The art of bathing should include towel swans but not laptops." The laptop obviously did not work well with the bath. You can't very well hold it over the water, so browsing was pretty difficult leaning over the edge of the bathtub. And I didn't leave it precariously on the edge of the tub the whole time! This year, I opted for checking my email on my iPhone, writing in our travel journal, and reading a book. With morning coffee and grapefruit-cranberry juice (they are so accommodating at the Cliffside Inn). Here I am trying not to drop the iPhone while I take this shot one-handed. 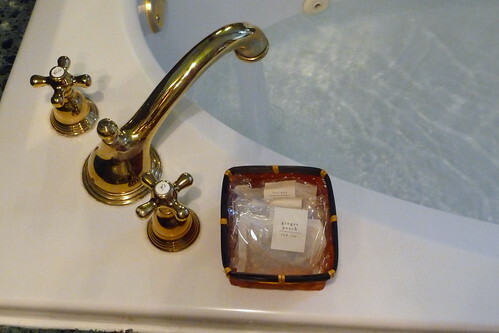 Another must for writing or reading is a bath pillow so you don't sink into the tub. For my first baby shower, I received a basket of items to pamper myself. A gift to take care of the new mother. In it were candles, bath salts and a basket of tub tea. Yes, tea bags for your bath. Ginger peach tub tea smells delicious! Another of our favorite rooms has the coveted skylight over the bathtub. Sometimes you can see the crescent moon in the sky above you. Here I am with the towel swan. We always think that this faucet looks like an old-fashioned telephone handset. And that is one happy gal in the bathtub. it sounds like you were having a time to relax while you were bathing! WOW! Those are some amazing pics and such a heavenly time! I would be in paradise there as well!